"Where do I even begin? Maret was such a joy to work with and I couldn't have asked for a better experience as a first time home buyer. She helped my husband and I in so many ways. She was very knowledgeable and honest when it came to picking a lender, choosing what areas of the city to live,the size house we needed to meet our needs, and other miscellaneous issues and concerns that came with buying a home. "Plain and simple, Maret will take excellent care of you from start to finish. You don't want to miss out on her expertise and knowledge...not to mention you will just enjoy spending time with her! Since the early 80s, I have purchased more than a dozen properties in multiple cities, but have never experienced a more caring or hard working realtor. She is honest and committed, has great communication and negotiating skills, and responds quickly to emails, texts or calls. I was relocating back to Denver from another state and knew I wanted an urban lifestyle, but wasn't quite sure what area would best meet my needs. Maret located more than two dozen properties for me to view in close proximity to Downtown Denver. She wanted to be sure I would be happy, excited and feel good about where I would ultimately purchase my Denver home. We narrowed my choices to three properties in two different locations, then revisited each for a lengthier look. It was helpful to have Maret listen to my thoughts, bounce ideas back and forth and help motivate me to make a difficult decision. We discussed the pros and cons of each property, so that by the time I made my choice, I knew it was going to be the right one for me. As evidence of her unparallelled dedication and knowledge of how quickly good properties go under contract in Denver's current hot market, even while hospitalized for knee surgery, Maret submitted a counter offer on my behalf because she didn't want me to risk loosing it due to what certainly would have been considered by other realtors to be a reasonable delay. "My husband and I are senior citizens and were so pleased with Maret's Real Estate services. We knew that Maret always did treat her clients as good friends, and this made our transaction a very positive experience. She went to the community and thoroughly researched the local market prices for comparable properties and thus accurately priced our property. She communicated with the owners of the cabin adjacent to our lot, and promptly sold the property to them negotiating fair price for both the buyer and for us. We were amazed by Maret's efficiency as she changed a challenging situation into a very positive experience! For all these reasons we certainly consider Maret Sanchez an A+ Realtor and have recommended her to many of our friends who have had to sell their homes or purchase a property. They have ALL had positive experiences with her as their realtor. Maret is always available, demonstrates her concern, truly listens, and is sincere...always having her client's best interest at heart. She is very approachable, knowledgeable, enthusiastic, and a problem solver. You will love working with Maret!​"
"Before working with Maret, my husband and I had looked for houses with a few other realtors. The process with those other realtors was not personable and just bad experiences overall. We were recomm ended to Maret by a family member and we are so glad Maret became our realtor. She is so friendly, passionate, and cares about her clients. Maret helped us find our first home and helped guide us through the home buying process. She is available whenever you need her to answer questions and is always putting your best interest first. We recommend Maret to everyone we know. Thank you Maret for helping us find our home!" "Maret was simply wonderful! Her experience and enthusiasm made us feel very confident about selling our house. Particularly rewarding for us was her persistence in going above and beyond to help u s overcome a solar power bump in the road to sell our house. Maret was outstanding in getting us through it. She is very knowledgeable, enthusiastic and informative. We always knew where we were in the process. We highly recommend Maret as a Realtor. We love her and recommend her every opportunity we get. We look forward to working with her in the future." "It took us a while to decide whether to buy or stay renting and her patience and understanding of our situation was so professional and yet personal. When we decided to purchase, she was right there willing to be available to go and look at homes, willing to listen to our concerns etc. all the details that go into deciding what's best for us....she was amazing. She was always there accompanying us to meetings, walk-thru etc. and not afraid to ask questions or point out concerns on our behalf. It was truly a delight working with her and the purchasing of our home went much smoother because of her. "Don't waste your time trying to compare realtors...take my word for it, Maret is without a doubt the best realtor you will ever work with! Several of my family, friends and co-workers have used Maret and we all can’t say enough good things about her. She helped me sell a house, buy a house and also purchase a piece of land in Castle Rock. Her expertise and advice gave me the advantage in every transaction. Some of the qualities that I love about Maret is that she's gives solid advice on how best to position an offer and many times encouraged me to stand firm on my counter offer when I probably would have preferred to just give in to end the back and forth. Every single time her advice paid off. Maret is so kind, honest, hard-working and listens. Maret Sanchez has become so much more than a realtor to our family…she is a trusted friend." "I work for a large bank and in being in that industry I come in contact with quite a few realtors. When I started thinking about purchasing my first home I contacted a few realtors that I had met along the way. Maret was the only one who called me back same day. Even though I was on the fence about purchasing, she had a lot of incite on what to expect. After our initial conversation Maret was willing to sit down with me and my Fiancé and go over what to expect like the time line, fees, inspections, ect. She even had a list of lenders that she has worked with in the past. It took us a while to find the right property and we were constantly calling her and meeting within that hour to look at houses that were just listed that morning. She was extremely dependable and flexible. When we found the right house, everything just fell into place. Maret works around the clock to get deals done, literally. She will go above and beyond for her customer." "We wanted to buy the empty lot located behind our home even though it wasn't actually for sale. Maret was diligent in determining the fair market value of the property, persistent in contacting the owner, and persuasive in negotiating the price. Even when we got frustrated, Maret was patient and confident that it would all work out. Without Maret, we wouldn't have the lot, and we're incredibly grateful for her kindness and her professionalism. We wouldn't want to work with any realtor but Maret. She's terrific! " "Maret assisted us for over a year in our hunt for a home. We started with existing homes and progressed to a new home build. Maret was an excellent advocate who communicated on a regular basis to ma ke sure the process was going smoothly. She helped us with choosing finishes clear through to the pre-closing inspection. Maret is an incredibly positive person and is high energy and charismatic. She truly cares about the people she works with! I would highly recommend Maret to anyone in search of a home or looking to sell. You will be a happy customer!" Maret was amazing and super helpful during our move. Our house needed a little extra work to get it sold. She helped us all the way along. She helped pick the right paint colors, furniture placement, and even swept my floors before the open house, making sure everything was perfect. She even came in and staged the whole house with her own stash. Pictures for the walls, stuff for the kitchen counter, etc. It all turned out amazing. Moving and sell can be super stressful. She made it so much easier and was there for every step of the process. "Maret helped us find a home in Denver proper in December 2016. She was incredibly attentive to every detail of our search and gave us more time and was more thorough than we could have ever imagined. We recently sold our home in New England, and though that too went well, Maret had set a bar that was just too high to even approach! I happily would rate her a 20 out of a top score of 10 stars! "I cannot ever thank Maret enough for helping me initially find the perfect house in Denver and then helping me to sell it when I accepted a new job in California. She is not only extremely knowledgeable about the Denver market, but was always available and patient with me throughout the process. She helped me find contractors to fix the things that needed fixing and went above and beyond when things needed to be done to get top dollar for my house. She and her son even helped me paint and stain the floor so that my house was ready for the new buyers! She made a stressful time much less nerve wracking by her attention to detail, her organization and her positive attitude. She even helped me find a realtor in Palm Springs so that I would have a place to stay there when I moved. If the realtor in Palm Springs is half the realtor Maret is I know I am in good hands. I now consider her a friend and not just my realtor. I strongly recommend anyone contact Maret if they are buying or selling their home. She is amazing to work with! We even have plans to go the the Coachella festival next year!" "Maret was terrific. We wanted to buy the empty lot located behind our home even though it wasn't actually for sale. Maret was diligent in determining the fair market value of the property, persistent in contacting the owner, and persuasive in negotiating the price. Even when we got frustrated, Maret was patient and confident that it would all work out. Without Maret, we wouldn't have the lot, and we're incredibly grateful for her kindness and her professionalism. We wouldn't want to work with any realtor but Maret." "My husband and I were anxious to sell an undeveloped property adjacent to a cabin we had previously owned, in a mountain community which was about 100 miles from our home in Lakewood, Colorado. Because of illness we were unable to go there ourselves. However, we knew that Maret Sanchez would represent us most comprehensively because as she often said to her clients, "I expect you to expect extraordinary service and personal commitment from me." She knows that clients deserve a quick response time and availability when they need her...and you can count on her to do both of these. We knew that Maret always did threat her clients as she would good friends, and this made our transaction a very positive experience. She went to the community and thoroughly researched the local market for prices for comparable properties and thus accurately price our property. She communicated with the owners of the cabin adjacent to our lot, and promptly sold the property to them, negotiating fair price for both the buyer and for us. We were amazed by Maret's efficiency as she changed a challenging situation into a very positive experience. For all these reasons we certainly consider Maret an A+ Realtor and have recommended her to many of our friends who have also had wonderful and positive experiences with her as their Realtor. Maret is always available, concerned, a good listener and sincere. It is evident she has her client's best interest at heart and is knowledgeable, enthusiastic and a problem solver. When you work with Maret, you will find all this to be true for yourself!" "Simply put - Maret was a true pleasure to work with when my wife and I were buying our house in Arvada. She was always very pleasant and cheerful as we requested to view house after house. Toward the end of the buying process, we felt that we had made a new friend in Maret and were saddened that after closing we wouldn't be seeing her almost every day. Maret was always available to answer our many questions and went out of her way to make sure that our interests were being thoughtfully addressed. She is what everyone should expect from their realtor whether they are buying or selling a home. Maret made an exciting but stressful time that much better with her fun and caring personality." - Aaron M.
"We thoroughly enjoyed working with Maret in our search for a house for our son and his family. She was fantastic at finding properties for us to look at and helping us evaluate their suitability and potential. She clearly enjoys the entire process of helping people find homes, and we could tell she worked hard at keeping her information current and her skills sharp. She was also great at helping us navigate through the financing procedure. The tradesmen she recommended to us were also fabulous. 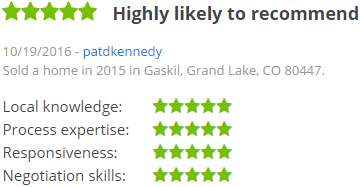 We recommend Maret highly to anyone looking for a home in the Denver area." - Kate M.
"Maret is a true professional, her diligence and tenacity in this market has made a huge difference in our lives. My daughter, son-in-law with their children, and I had just went under contract to purchase another home that was nice, but it was going to be more of a project for us and needed lots of work, time and money. Maret sensed that all individuals involved weren't exactly happy with this certain home. This prompted her to continue to search even though we were already under contract. As a last-minute and pleasant surprise, Maret had found one more home that had just gone on the market that wanted to show us. We all instantly fell in love with this property and will spend many happy years in this home. It was Maret's professionalism and profound willingness to keep searching that ensured all individuals involved with this sale were satisfied and happy, which in the end enabled us to find our dream home! Thank you very much, Maret!" - Lenny M.
"I bought two rental properties through Maret. She was very professional throughout the process, from showing the first house to the closing. She listened to what I was looking for and only took me to homes that fit my criteria. I would have no hesitation to buying another home or listing a home with Maret." - Marsha B. "Maret made our first time home-buying experience very special! Maret was a pleasure to work with, always prompt in her responses, knowledgeable while guiding us through the process, and very patient with our numerous questions! Maret educated us about the zoning and remodeling of the Highland neighborhoods we were interested in. We were so lucky to have had her as our Realtor. After deciding between the Downtown Denver townhouse and the new-build home in the Highlands, we chose the Highlands home! I don't know if our deal would have happened without all her efforts!" - Tara E.
"It's very refreshing and reassuring to have a professional like Maret on your side when you're making such life impacting decisions, such as buying a home. Her genuine concern for my happiness and dedication to keeping me informed every step of the way is enough to keep me coming back time and again." - Kevin S.
"Maret Sanchez is an excellent Realtor! She was professional at all times, and if I had any questions (no matter how small), she was always willing to help! She sold my house in one week! I had never sold a house, and she walked me through the whole process from start to finish with sensitivity and compassion! 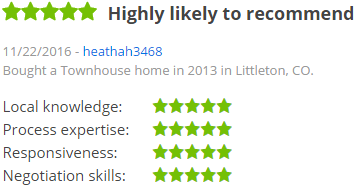 I enjoyed working with her, and would recommend her to anyone buying or selling a house!" - Linda F.
"Working with Maret was a terrific experience. She was incredibly patient with us as we were not certain if we were going to purchase, or continue to rent as we had been. She never gave up on us and after an amazing amount of work on her part; she found us the ideal property and sunk her talons into it with brilliance until it was ours. We were blessed to have her working for us, and she is wholeheartedly recommended." - Sarah M.
"My wife and I met Maret at an Open House and we were so glad we did! We knew we wanted to begin searching for our second home. We had a bad experience with the Realtor who sold us our first home, so we knew we needed to find a Realtor with passion and that was truly working for us and for our best interest. We wanted to see lots of properties before purchasing and were undecided about the area we wanted to move to. We had two children near school age so this had to be factored into our search. Maret goes beyond the call of duty over and over. She was never "pushy'....never trying to talk us into purchasing. In fact quite the opposite! There were a couple of properties my wife and liked, but her critical eye pointed out some things about the property that we had not seen or thought about. We were so glad we had Maret with us when she found us the perfect home. Her willingness to continue looking until we found the right home was sincere. She never made us feel guilty about looking at what we felt a "zillion" houses. We often had to take our small children with us and she made it seem like a fun "adventure" ....in fact they always looked forward to looking at houses to see Maret! Her negotiating skills were awesome as well! We had forgotten about all the ins and outs of purchasing and she was always so careful to explain everything which made my wife feel especially comfortable about signing all the documents. We never felt silly asking any questions...and there were a lot. Lastly, we were all set to use our previous lender, but Maret recommended us to a couple of her lenders and we ended up going with one of them and getting a much better rate and service all around. The house we purchased needed some minor improvements and her recommendations for contractors were reasonable and very good at their jobs. We recommend Maret to everyone we know who is looking to buy or sell a home! They will not be disappointed!" - David L.
"Maret and I first spoke back in October of 2010. I had originally called to see the price of a town home that was in our current area. From that day until we purchased our house in May of 2012, Maret was in constant contact with me. My husband and I had some credit issues that we were slowly working on. Maret never gave up on us. She was not only for looking for houses that met our requirements, but she was also looking for lenders that would help us purchase our first house as a family. I swear to this day if it weren't for Maret we would have never have been able to purchase our home. Once we got qualified and were able to begin a serious search, she made sure to give us options. There were so many different houses, and her ideas helped open our eyes to other possibilities, besides just the criteria we thought we were set on. After I think 30 or more houses, plus a wicked time frame.....we found our house! ​Maret always took the extra step. She always made sure to keep in constant contact with us while we were under contract and explain things to us step by step. If we have to purchase a larger house down the road, we will only work with Maret. Her dedication to us as a family was amazing! "We have worked closely with Maret for almost 2 years to sell our previous home and to find and contract for a new home we are building. It has been an intense experience! But, with Maret’s professional guidance and experience we have been able to achieve financial and emotional success. Maret’s keen insight into the local real estate market enabled us to perfectly time the selling of our previous home. To prepare our previous home for sale we conducted an estate sale approximately 2 months before our home was listed. Maret identified and helped us arrange for the sale with a very experienced estate sale professional. We were very pleased with the financial outcome of the sale. But, more importantly, we were able to reduce the amount of furniture in the house which made it easier to stage for showing. We cannot say enough good things about the quality of the sales brochure that Maret helped prepare for the sale. She staged the home for the photography and when we saw the finished brochure we were not sure we wanted to sell the house! The house went on the market at an absolutely perfect time with cool weather, flowers in bloom, etc. We had 17 showings in 9 days and were able to contract with the new owners at our full asking price. We believe that Maret’s keen sense of timing the local real estate market was key to our success. Once we had a contract in hand Maret helped guide us through the inspection and closing process which took a little more than a month. We are pleased to report the closing went as smoothly as one could hope. While the sale effort for our previous home was underway we were diligently searching for a new home. Maret showed us many properties. She provided us with daily updates on new properties and we were able to see most new listings within a day or two of their being placed on the market. We spent many hours with Maret talking about what we wanted in a new home and she provided many useful suggestions and ideas to help us hone our expectations. When all was said and done we decided to build a new home so that we had a better chance of satisfying our wants and needs. Maret was right there with us helping with all the legal and emotional issues. We are now patiently watching the construction process and waiting for the day we can close and move into our dream house. In summary, we could not have done all this without Maret’s tireless efforts and patience. We remain amazed at her energy, enthusiasm and savvy about the entire process. When all is said and done Maret has not only become our trusted advisor but our good friend. We feel blessed to have had her guiding us on this journey and would, without any hesitation, strongly recommend her to anyone seeking professional real estate service."